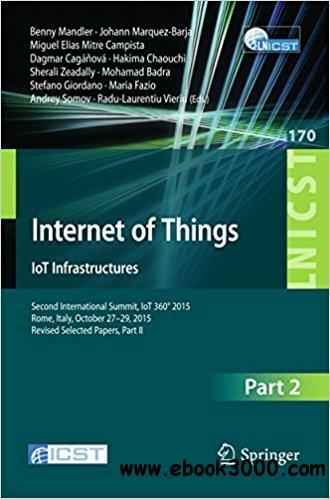 The two-volume set LNICST 169 and 170 constitutes the thoroughly refereed post-conference proceedings of the Second International Internet of Things Summit, IoT 360�� 2015, held in Rome, Italy, in October 2015. The IoT 360�� is an event bringing a 360 degree perspective on IoT-related projects in important sectors such as mobility, security, healthcare and urban spaces. The conference also aims to coach involved people on the whole path between research to innovation and the way through to commercialization in the IoT domain. This volume contains 61 revised full papers at the following four conferences: International Conference on IoT as a Service, IoTaaS, International Conference on Mobility in IoT, Mobility IoT, International Conference on Sensor Systems and Software, S-Cube, International Conference on Interoperability in IoT, InterioT, International Conference on Software Defined and Virtual Future Wireless Networks, SDWNCT.